AirConsole has the best free online games! AirConsole is the leading local multiplayer gaming site that offers free online video games to any user. Why do we provide free online video games? AirConsole strongly believes that everyone should have access to games that bring people together. At your next get-together, you can spend quality time with the family or get to know your friends a little better. Gaming is an excellent way to collaborate together or enjoy some healthy competition. There are some surprising benefits to playing video games other than making social connections with others. Video games have physical advantages as well. They help curb stress, increase hand-eye coordination and balance, and in some cases have helped people overcome dyslexia. AirConsole wants you to reap the many benefits to playing video games online - especially when they’re free! AirConsole is a prime figure in the evolution of video games in today’s culture as it relies on tools that are unique, new, and easily accessible. The basic premise of AirConsole is actually ingeniously simple. AirConsole is an online platform that transforms your browser into a full-fledged, ultra-versatile video game console. AirConsole does not discriminate between laptops or smart TVs, either. As long as your display has a functioning internet browser, AirConsole and all of its free online games are already waiting for you. 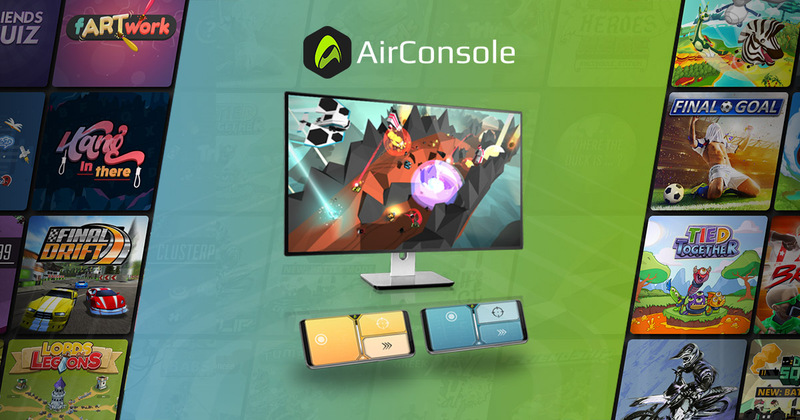 It doesn’t stop there — AirConsole also turns your smartphone into a futuristic gamepad! Now you can control our free online games on your browser using your smartphone. Smart devices are definitely impressive as stand-alone products, but AirConsole has now given a fresh new twist by allowing them to work in tandem. The overall effect is dazzling, and it’s unlike anything you’ve ever experienced. This means you won’t have to spend any money on additional controllers for your friends to join in. The games are completely fun to play, too. Whether you enjoy racing, card games, puzzles, quizzes, or more, we have a wide variety of free online games to choose from. You’ll find that all of AirConsole’s free online games contain a plethora of unique characteristics. There are rich characters, completely original stories, and awesome graphics that truly come to life right before your eyes. It’s guaranteed that you’ll never be bored again playing our games. Do you have a taste for the mystical and fantastic? You can head over to Valhalla, a dynamic multiplayer field where you can both play as and fight against wizards. In this game, your main mission is to seize the souls of the other players and pull them towards an altar in order to gain favor from chaos god Loki! If it sounds intense — that’s because it is, and it’s one of those free online games that are sure to get your heart pumping. Grab a few of your best friends and start playing or bring this out at your next big party. Maybe you’re looking for more of an old school experience. All of these new games acquired their inspiration from the classics that preceded them. After all, revisiting those classics is always an entertaining experience — especially when that experience comes in the form of free online games! Brick Wars is a great place to start your classic arcade experience. This is a fresh take on the tried and true brick breaker classic. This time, instead of combatting your opponents in a dueling style, the objective of the game is to engage in competitions to destroy each respective half of the field. It’s time to test your skills and your speed! The multiple levels found in Brick Wars gradually increase in difficulty as you progress through the game, so make sure to stay on your toes! Out of all the free online games found on AirConsole, this is definitely one of the most nostalgic. In this section, you will find a variety of unique gaming experiences, such as everyone’s favorite classic, Karaoke! What sets this version of Karaoke apart from all the others is its extreme user-friendliness. For example, if you’re a little rusty on the lyrics and rhythm of the song you’re covering, the virtual artist on AirConsole’s Karaoke app will swing right in where you falter off so that you can catch right up. With a library containing over 7,500 songs covering every type of music you can imagine, AirConsole’s Karaoke is one of those free online games that has a little something for everyone, no matter where you are or what your taste in music is. Another great party app on AirConole is YouTube JukeBox. This app has a simple user interface that allows you and your friends to collaboratively add videos to a playlist and vote on videos in the queue. YouTube JukeBox is sure to become a staple at all of your upcoming parties. Nothing spells out a good time like a game of cards. AirConsole offers a hilarious free online game called Cards and Humanity. AirConsole’s homage to the popular taboo game stands out nicely in its roster of free online games, giving the classic card game experience a virtual twist by switching its format from the table to the screen. In this version of the card game, each player controls a set of cards that only they are allowed to see. A set of words is displayed on the screen that you can use to fill in the sentence shown on the screen. Each player votes on the best (or most ridiculous) sentence formed. AirConsole’s artificially intelligent narrator named Norton dictates the sequence of events that transpire in the game, all while zany elevator music plays in the background. You and your friends will be laughing all night long. Due to the content found in some of the cards, this game is rated Adults Only, so don’t try pulling any fast ones, kids. If this isn’t your style, we’ve got other card games well. You can try out classics such as Texas Holdem. The AirConsole PadPoker version supports up to 10 players. Match Me If You Can is a favorite for children. In this video game, you play against a friend to see if you can spot a match before the second player does! All of the games highlighted above and many more free online games found on AirConsole’s roster are totally multiplayer-friendly. This makes AirConsole the ideal activity for any group of people. It really works in all settings: whether at a children’s birthday bash, your buddy’s bachelor party, a family reunion, or even to turn a bleak office lunchroom setting into a virtual party experience — AirConsole has essentially all events covered. Multiplayer gaming is great for any occasion. It’s also beneficial for educational experiences as well. Teachers can reward their students with an AirConsole session on a classroom’s projector. They can also create their own quizzes where students can answer questions through their smartphones for a more interactive learning experience. This is especially useful if they happen to have a difficult test or quiz coming up. The possibilities are endless. AirConsole’s free online games include some strategically cooperative selections that happen to be the ideal icebreakers for any event where team building is essential. Who knows, AirConsole can even help you break the ice on your next date night. Of course, sometimes we just want to test our skills alone through single player games — AirConsole has a fair selection of those as well. Really, there are options for free online games on AirConsole that include every desired experience. Living in today’s world, with all the myriad of fun you can have through video games, money is the last thing that we want stopping us from embarking on virtual adventures. For this reason, AirConsole makes their entire experience completely free! As long as you have a good internet connection, you can play. No additional software needs to be downloaded. All you have to do is synchronize your devices, strap yourself in, and get ready to play. As long as you have access to basic electronics like a smartphone and laptop, AirConsole and all of its games are entirely yours to explore. If you are a parent with young children, AirConsole has you covered indefinitely. We kept parents in mind when we filled AirConsole with our free online games so that you would never have to rob your child of a great experience. There’s nothing in the world quite as heartwarming as the look on a kid’s face when they’re having an absolute blast, especially when they’re playing with their friends. You can also let them play AirConsole as a reward for good grades and great behavior. Thanks to AirConsole, you can give your kids all of the fun they can handle without having to lift your wallet out of your pocket. You’ll be able to save all the money you would have spent and put it towards something truly meaningful. The whole system is so easy that you can set yourself up to start using AirConsole within minutes. Just make sure you have reliable internet access. If you do, you have already completed step 1! Next, go to Airconsole.com, our home page, and click on the start button. You will then see a random code of numbers that will be displayed on your screen. Remember this code, because on your smartphone, go to our home page type in that exact same code. Just give it a moment to sych together, and that’s all you’ll have to do. Now you’re connected, simple as that! Just follow those steps and you’ll be instantly ready to select from our free online games. When your friends or other people want to join, all they have to do is enter that same code into their smart devices. So, the question is, what are you waiting for? Dozens of free online games await you. Our service is totally free and and includes a variety of amazing video games that you can experience in a totally unique way. Get started playing free online games right away. This free browser game supports unlimited players! Challenge your friends today by instantly connecting your smartphone to use as your controller - may the best wizard win! AirConsole is an online video game console. Play over 130 multiplayer games. Your smartphones are the gamepads.